'The Coyote Who Spoke In Tongues' is the new album by former Kyuss frontman John Garcia. The follow-up to his 2014 self-titled debut was recorded and mixed by Steve Feldman and Robbie Waldman, mastered by Gene 'The Machine' Grimaldi at Oasis Mastering in California and features Garcia's longtime tourmates Ehren Groban, percussionist Greg Saenz and bassist Mike Pygmie. Garcia said: "This record is one of the most important of my career, difficult and challenging to do, but worth every minute of sweat." As well as his work with Kyuss and his solo efforts, Garcia has performed with acts such as Vista Chino, Hermano, Unida and Slo Burn. The singer said last year he doesn't think there will be a Vista Chino comeback with Kyuss colleagues Brant Bjork and Nick Oliveri – and that he'll focus on his solo career for the foreseeable future. 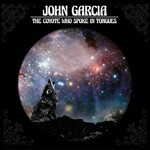 Garcia has also confirmed he'll tour in support of the record in March and April next year, though he has not yet announced dates. 'The Coyote Who Spoke In Tongues' will be released on January 27.